Tirto Utomo or Kwa Sien Biauw (born in Wonosobo, March 9, 1930 - died March 16, 1994 at age 64 years) is Indonesian businessman. Graduates of the Faculty of Law University of Indonesia is known as the founder of Aqua Golden Mississippi in 1973. In addition, he also had a whole board Badminton Association of Indonesia. On March 16, 1994, he died and was buried in the cemetery of Chinese residents near Hotel Krishna, Wonosobo. After graduating from junior high school continues to Tirto Utomo HBS (senior high school at the time of the Dutch East Indies) in Semarang and then at the SMAK St.
Albertus, Malang. The next two years of college at the University of Gajah Mada, but eventually moved to Tirto Faculty of Law University of Indonesia. In Jakarta and going to school he worked as Chief Editor of Sin Po newspaper and magazine Pantja color.In 1959, he was dismissed as chief editor of Sin Po. As a result the family's financial resources are not clear. However, due to events that have the will Tirto Utomo the round to finish his education at the UI School of Law.After graduation, Tirto Utomo submit a job application letter to Permina (National Oil Company) which is the forerunner of Pertamina. Once received, it is placed in the base Brandan. There bathing purposes is still using the river water. Thanks to his diligence, Tirto Utomo eventually rising to be entrusted as the spearhead of marketing the oil. 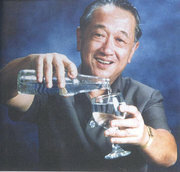 However, at the age of 48 years, Tirto Utomo chose early retirement to deal with some private companies that AQUA, PT. White steel, and the Oasis restaurant.Aqua was founded with brother-in-law with a capital Slamet Utomo of Rp 150 million. They set up factories in Calcutta in 1973 with the name of PT. Golden Mississippi and the production of Aqua brand. Employees initially numbered 38 people. They dug a well in the first factory was built on the land area of ​​7110 square meters in Calcutta. After working hard for over a year, Aqua's first product was launched in October 1, 1974.One customer, namely aqua Jagorawi highway construction contractor, Hyundai. Of the South Korean engineers, drinking mineral water was transmitted to their native peers. Through a kind of contagion that eventually bottled water is received in the community.Today, the family Tirto Utomo is no longer the majority shareholder since 1996, the French food company Danone controls a majority stake. Their main brand, "AQUA" the market leader in bottled drinking water business.